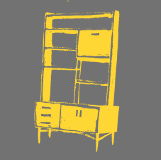 Products: As well as new design pieces MoseyHome sells high quality secondhand mid-century and vintage furniture and homeware which means there may be signs of wear even if the piece has been well looked after and/or restored. We do our best to ensure that the photographs on the site are accurate but please note colours may differ slightly from real life and will also appear different when viewed on different devices. All measurements are as accurate as possible. Availability: This website is owned and manually maintained by MoseyHome. We update it regularly but are not always able to instantly mark an item as 'sold' the moment it sells: in the unlikely event of your placing an online order for the same item in this brief time slot we will contact you, refund you the cost and offer to help you find a similar item. Electrical items: All electrical items are offered for sale as vintage collectors' pieces. We check electrical items for any obvious damage and to ensure they are in working order but we offer no guarantee that they conform to current electrical safety regulations and strongly advise buyers to have them tested by a qualified electrician. Returns and refunds: We're confident you will be delighted with your purchase but should you wish to exchange or return any item, please contact us within fourteen days and we will offer you a voucher of the same amount to spend in MoseyHome, where appropriate a full refund of the purchase price will be made upon the item's return in the condition in which it was sold/sent to you. Buyers will have fourteen days to return the product after we have agreed the return. We will not refund delivery costs nor pay for the return delivery unless the item arrived significantly damaged (in pieces) or was entirely different from that seen in the photo. Personal data: We only collect your personal data in order to process your order and we will never pass it on to any third parties or use it for any other purpose. We won't add your email address to our mailing list unless you have requested to join it.